Some people are born legends. Nadine is one of those people. 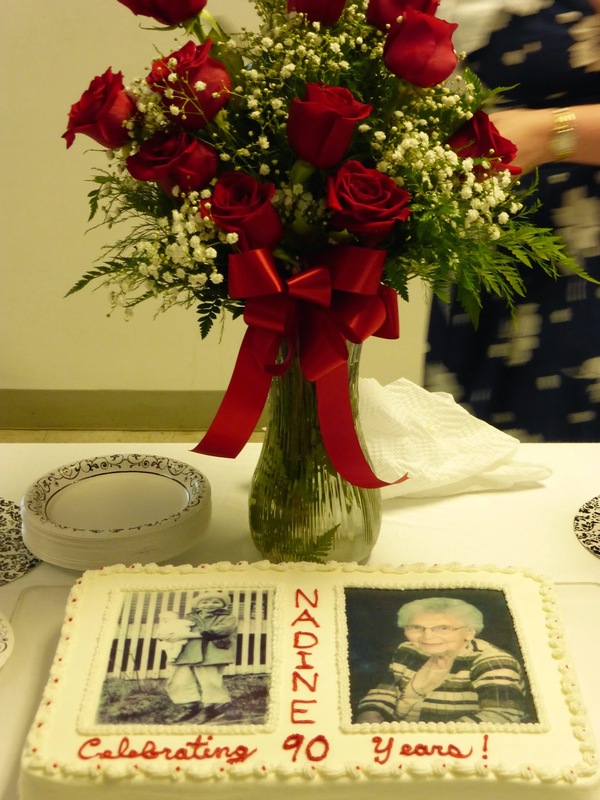 90 years young, Nadine celebrated a landmark birthday this past week. And she celebrated in style and grace befitting her life. Her family threw a huge party for her at the church - stories were shared, laughter and smiles were plentiful. There were photos and memories and keepsakes. Lessons learned and passed down through the generations. There was even her first boyfriend coming to celebrate with her. Everyone wanted to celebrate Nadine. I learned Nadine's story well before I met her. Over three years ago, while interviewing for the position of pastor at Christ and Trinity, where Nadine has been a member for most of her life, I heard about Nadine before I ever met her. I heard about this 80-something saxophone playing, volunteer coordinating, faithful, forgetful, and wise child of God. Stories were shared of Nadine learning to play the saxophone in her 80's and playing in the Sedalia Community Concert Band. I heard how Nadine gathers dozens of volunteers for worship each week. And for some reason, there were always stories of Nadine losing her keys. Or her cane. Amid each story, a vignette of this woman came to me. A picture of a deeply faithful, loved, and legendary woman. Someone to know and love. Someone who knew how deeply loved she was. When I met Nadine, I too came to know and love this beautiful child of God. I came to recognize her gifts and laugh with her. I learned the story of her life. And give thanks for the family she raised and loved. So it is with God. God knew Nadine before she was born. God called her into this life of faith. God walked with her through 90 years of love and grace. And God will continue to know her and love her even when her time with us is no more. Celebrating with Nadine's family and friends, we each gave thanks for the God who knew Nadine and gifted her to us to know and to love. We gave thanks for the God who weaves our story into God's abundant grace found in the life, death, and resurrection of Jesus. Not only Nadine, but each of us, are known and loved and claimed by God well before we're born. Before time began and into the future, our story remains held by God. Hi Kimberly! I'm Heather and I wanted to know if you would be willing to answer a quick question about your blog! My email is Lifesabanquet1 AT gmail DOT com :-) I greatly appreciate it!